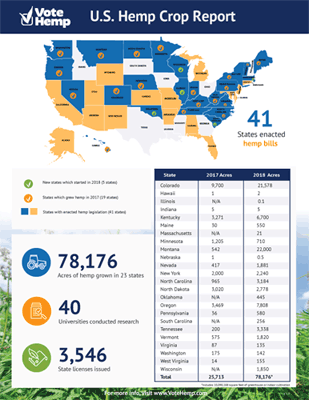 Since 2016, Vote Hemp has produced an annual Hemp Crop Report documenting the licensed cultivation of hemp in the United States. The annual hemp cultivation data and other statistics are provided by state departments of agriculture. Where states were unable to provide data on the hemp acreage planted, we estimated at 70% of licensed hemp acreage. This estimate is based on data collected in other states that has shown an average of 70% planting rate. Please share the U.S. Hemp Crop Report widely.